Shock waves pulsate down the valley as another bomb is detonated less than 100 yards from where we are standing. A thunderous echo follows a half second later, raising the hair on our necks. We wait a moment with baited breath for grievous screams from victims of the disaster. Instead only jubilant cheers ring out in the explosion’s eerie aftermath. It becomes apparent that no casualties eventuated from this blast. Soon the sky flares up again, another cluster bomb erupts in the night. Will the revellers be so lucky this time? The Vietnamese New Year, known as ‘Tet’, coincides with the Chinese festivities and is in every aspect the biggest event in the country’s calendar. For up to a week, family and friends gather to eat, drink, be merry and conduct religious blessings for their deceased ancestors. It is almost always a time for celebration and happiness, something that is much anticipated by everyone. In the small rural village of Phong Nha in Central Vietnam, Tet is just as revered as anywhere else in the country. But here the nation’s turbulent history plays a distinctive role in the celebrations. Thousands of unexploded cluster bombs, grenades, mortars and missiles scatter the landscape as a dour reminder of previous wartimes. Some that are discovered are kept hidden in people’s homes until Tet, where they are detonated in delighted and perilous fashion; much in the same way fireworks are used in the West. This practice is as dangerous as it sounds. In 2014 two men died when the bomb they were igniting exploded before they could run to safety. On the eve of Tet, one hour before midnight, I sit on the ground of Phong Nha’s expansive pastures with Hoang, a local friend. All around us we can hear laughter as intoxicated Vietnamese men cheers to good health and down shots of potent, home-brewed rice wine in the darkness. Hoang looks at me with carefree eyes. “Just a few months ago they found a bomb very close to where we are sitting now. Not a big one, but big enough. Some farmers found it and took it away. I don’t know what they did with it.” I ponder this and run my hand through the grass, wondering how many more lay hidden in this meadow waiting to fulfil their deadly purpose. 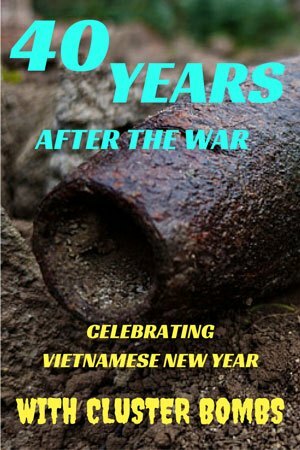 It has been 40 years since the official end of the Vietnam/American War on April 30th, 1975, and almost 42 years since the last American bomb fell on the communist nation’s soil. While the rest of the world has all but moved on, in Vietnam the effects from the 7.8 million tonnes of explosives dropped during the war are still felt by the entire population. “The families here are very poor, so they need to find ways of making money to feed their children,” Hoang continues. “If they are caught with the bomb they will go to jail for seven years. But if they can sell it for scrap metal, they will put food on the table for many weeks.” He consciously avoids discussing the other, much more severe consequence of what may happen to those who are unsuccessful in defusing the explosives. An estimated 100’000 Vietnamese have been killed or injured from unexploded ordnance since the war was officially ended in 1975. A flash of light suddenly dances across the sky and the earth violently shakes a moment later. The partying locals have detonated another bomb in the village. 800’000 tonnes of unexploded ordnance remain scattered across Vietnam, but now there is one less piece to worry about. The Central Vietnamese provinces of Quang Tri and Quang Binh were the most heavily bombed regions during the entire War. On the 17th parallel a demarcated area known as the ‘De-Militarised Zone’ separated the communist North from the allied South. As the narrowest part of the country, and the point where the most important of the infamous Ho Chi Minh Trails diverged, it is here that the US focused most of its power on destroying. Phong Nha lies in the middle of these provinces. Over 15% of the land here is still lethally contaminated, placing every single commune and its inhabitants in danger. The non-profit organisation Mines Advisory Group (MAG) has been working in Vietnam since 1999, assisting in clearing the country from the remnants of war. Officials state that at the current work rate, it will take over 100 years to clear the land from ordnance. The task MAG has in front of them is too tremendous to match with their limited funding. With unexploded cluster munitions being discovered daily, the amount of work they have continues to grow faster than they can manage. As a result, locals have taken the job into their own, untrained hands. Hoang gestures towards his son, who is sitting with his mother on the step of their house. “I am afraid for the children here. They are the most affected. They find the bombs in the jungle and don’t know what they are. The kids, they play games with them because they look like toys. If they accidentally find one that is still live…” His voice trails off, leaving our thoughts to finish off the heart-breaking scene. He looks at his watch, and shows me the time. We are seconds away from midnight. “I hope you’re ready for the show,” Hoang exclaims, quickly forgetting the somber conversation we were just having. This is typical of the attitude of the Vietnamese – a strong resilience to hardship and an ability to focus on the positives, even in a tragic situation. The night sky turns to day as whatever bombs haven’t been sold for scrap are ignited throughout the town. The land trembles continuously, as though under the effects of a minor earthquake. The sound and vibrations of hundreds of simultaneous explosions resonate deep into our bodies. For almost 10 terrifying minutes we are offered an experience at what it must have felt like during the war. A shot glass full of rice wine is put in front of me. Hoang smiles and wishes me a happy new year. He casts his eyes up at the flashing sky, and then towards his son. “I pray there will be no more accidents for my people this year.” 40 years after the fighting ended, we can only hope. Bomb craters scar the earth around Phong Nha – visual reminders of the harsh realities 40 years after the war.